I take risks - I drive over the speed limit, I don't come to complete stops at stop signs. But, I usually don't get caught. I am aware of my surroundings and I am alert to whoever is nearby that might catch me. But not this time. I was in unfamiliar territory and I was careless. I was on my way from Oklahoma to New York City, December 2008. It was the end of a tough semester at Oklahoma State University and I needed to get away and retreat to my sanctuary of an apartment in downtown Manhattan, overlooking the Hudson River. I had flown into Newark Liberty airport (the name Liberty was added after 9/11) and taken the Airtrain from Terminal A to a station nearby where I caught a New Jersey Transit train that would take me one stop to the Penn Station in Newark, New Jersey. At Newark Penn, all I had to do for the next leg of my journey was to walk across the platform, buy a ticket, and board a PATH train that would take me through the metro cities and then under the Hudson River to the pit of the World Trade Center. These trains, of course, could not operate after 9/11 but as soon as the rubble was cleared out of the smoldering pit, one of the first priorities was to resume service on the PATH trains. Too many New Jersey commuters depended on the train to get to work. And New York City needed to get people back to work. So a temporary station was constructed at the edge of the Trade Center site and the trains began running again. From the Trade Center, it was a walk of just a few blocks to my apartment. But I'm still in the Newark Penn Station. I had ridden this train previously and remembered that the fare machines took cash - 1.50, then raised to 1.75 (the transit systems in the metro area were hurting for funding. The New York City subways have raised their rates also). I had a handful of quarters in my hand, out of my pocket where they had been during the flight, ready to deposit in the turnstile. I didn't want to miss my train. Whoa. There was no place for the coins. There were new vending ticket machines that took money and dispensed tickets. Okay. But instead of using coins, I opted to use my credit card. I charge on my card whenever I can, even for just a few dollars. I want to earn the miles that are good on Continental Airlines. Continental flies the only nonstop between OKC and NYC. Well, not technically to NYC, but to Newark where Continental has its second largest hub (after Houston). Typically, I avoid connections and layovers, unless I want to explore a new airport. I didn't want to explore on this trip - I just wanted to get home and rest. So I inserted my card and bought one ticket for the PATH train to Manhattan. Out came the ticket and then, short pause, the credit card receipt. Fine. The train hadn't arrived, yet. One time, the PATH train was sitting at the platform and I was able to put in my coins, step through the turnstile, and right on to the train. Easy. This time, however, the train was not there. So, I stepped right next to the turnstile machine and inserted my fare ticket, noting the proper direction and orientation. The ticket is just a piece of heavy paper (or light cardboard) with a magnetic stripe and the info printed on it - the location, the date, and the time of purchase. I stepped forward into the turnstile but noticed that on the screen there was a bright red error message. The machine didn't accept my ticket. I took a step back and tried again. Rewind and repeat. Card in, being more careful this time to make sure I was following the instructions printed on a label adhered to the front of the machine, right by the slot for the tickets. I checked the screen. Pooh, another error message. Okay, this is a faulty machine. The machines all appeared to be brand new so maybe there were still some bugs in the electronic system. I backed out and tried the next machine of about 4 that were aligned in chorus line fashion there on the platform, all in perfect synchronization, awaiting their cue. But, no luck. The next machine flashed the same error message. So did the next one. And the next. None of the machines would accept my ticket that was now only about a minute old. I looked around. What do I do now? I don't want to miss the train. I'm tired, sleepy, and eager to get home. I saw no one that looked like an employee or an official that could help me get into the PATH platform. Next to the last machine was a wide entrance equipped for wheelchairs. The two plastic arms that closed off the entrance didn't meet in the middle - there was quite a gap between the two arms. Hmm, I can fit through that gap. And why not, I bought a ticket. I even still had it out in my hand. So, I turned sideways a bit and squeezed on through. Great. I won't miss my train. But before that thought finished processing in my head, there were two officers standing right in front of me. How did that happen? I am usually so observant I spot such things. But, not this time. Maybe I was too preoccupied with catching a train, the error messages, the cold, or the desire to get home. But, dang, I got caught. The first officer (the other guy never said a word) asked what was up. I explained that I bought a ticket - I showed my open palm with the ticket - but the machines wouldn't accept it. “Sorry, he said, I've got to write you a Complaint." He asked for my ID. He walked a few paces to a room right there on the platform between the NJ Transit tracks and the PATH tracks. Authorized Personnel Only. He disappeared inside. The other officer stood guard to monitor me. I smiled. He barely returned the smile so I figured it would not be worth my time to talk with this guy. I pulled out my iPhone and checked email. Anything to look busy. Other waiting passengers were staring, maybe wondering what this tall guy had done. Maybe waiting for something interesting to witness that might break up their routine commute and something they could share with their colleagues at work or at home. I was happy to disappoint them. No real action here - I'm just gonna check my email. After a few minutes, the steel grey door opened and out came the officer. He handed me back my ID and explained the Complaint that he had written up. When he tore my copy out of his ticket book, it ripped, so he had to write by hand the missing part of the Complaint case - the prefix letters. He said there was still part of the Complaint missing but he said I wouldn't need that info. Fine. After his explanation, I mentioned that I lived in Oklahoma and could I just send in the fine payment. Sure. 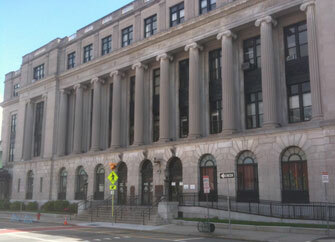 The Newark Municipal Court would send me details on the case and instructions on what my options would be. Okay. Maybe this will turn out to be just a minor nuisance - nothing major. No big deal. Even though it seldom happens, whenever I get a ticket for anything - speeding, not wearing a seat belt - I have a routine and a philosophy that I follow. I chat with the officer. He's just doing his job and I did choose to violate a law, even if its a silly law. Its just not worth arguing with police officers. So, I accept the ticket and plan to pay the fine the very next morning. I don't dwell on it, I don't fret, worry, or make it a big deal. I choose to drive over the speed limit, not put on a seat belt, whatever, and I accept the consequences - I will sometimes have to pay a fine (often, I just get a warning.) And paying a fine for something that I am admittedly guilty of just does not merit the negative energy it would take to whine and lament the ticket and the fine. After just a minute or two, the PATH train screeched into the station. The doors opened in unison. I let some others enter, then I stepped in. I sat down and resolved that, as usual, I would simply await the notice from the court and pay the fine soon after. I would let go of the whole ordeal. No ego bruised, no serious consequences, no delay in my journey home. By this time, the train had left the shelter of the station, the sun streamed into the railroad cars and I turned in my seat - these trains had bench seats facing the center aisle running the length of the car. So, I turned in my seat to enjoy the view during the trip to Manhattan. We pass through downtown Newark, over the Newark River, past the PATH rail yard, and then a couple of stops in New Jersey. Soon, the Statue of Liberty comes into view. Well, the back of the grand lady. She faces Hudson Bay and the tracks run along the mainland behind the statue. I had turned my attention to the upcoming week - a week of museums, walks around town, great food, and some productive work while enjoying my apartment in Battery Park City, down at the very tip of the island of Manhattan. FYI: the acronym PATH stands for Port Authority Trans Hudson. The Port Authority is an interstate agency that was set up to administer and manage various metro transportation operations - the PA operated the World Trade Center and had offices in the towers, it even has its own security force, and a multimillion dollar budget. The Trans Hudson refers to the fact that this train crosses under the Hudson River - PATH. I had almost forgotten about the Complaint for ‘Fare Evasion' from Newark, New Jersey. Since then, I had had a great week in New York City, a smooth flight home, and a good visit with family in Dallas for Christmas. After I returned to my home in Edmond, north of Oklahoma City, I was going through the pile of mail that had accumulated while I was gone. Memory jog - there was an official notice from the Municipal Court of Newark, New Jersey. Whoa, there's another one, identical to the first. I opened both. I suspected these would be the notices about the Complaint I had received and would give me instructions on how to take care of the matter. Good. I can mail in my check and get some closure on this Complaint. I scanned the printout of information. As is often the case with documents from government agencies, this one was hard to comprehend. Rarely are these forms designed, laid out, or written to make much sense to the reader. I don't know if its because these forms are written by lawyers, bored clerks, minimum-wage aides, or just poor 'graphic designers'. But they were not designed by people who excel in information graphics. I once received a Jury Summons from the Oklahoma County court and, while waiting in the jury room for a full day, rewrote and redesigned the summons to be very easy to follow; included info about parking, eating, what to expect during the day, and some basic info on how the judicial system worked. I showed a draft to the other potential jurors to get their feedback and comments. All responded that it was much clearer and more informative. Many said they wished they had gotten this form instead of the one that was sent. I revised and printed out the new brochure and submitted it to the County Clerk. I told him he could use it for free - no payment, just because I wanted it to be better. I have yet to hear back from his office (but, then, its only been 12 years). My experiences have lead me to conclude that government agencies don't take too kindly to suggestions from citizens. Maybe they feel insulted. Maybe they're too ignorant. Or maybe they just don't care. I did finally make sense of the form from Newark. It didn't give me any instructions, it didn't even tell me how much the fine was or how I could pay it. Instead, it was a Change of Court Date form. I checked the second one. Maybe it had the info I was seeking. Nope. The second form was identical to the first. Exactly the same. Why did I not receive the instruction form? Why two Change of Court Date forms? I hoped to find out. I called the phone number on the form. I was on hold for about 30 minutes. I know that when calling tech support, ‘customer service', or any bureaucracy, that its beneficial to have some work ready for the long periods of hold. One nice feature of the iPhone is the speaker function. I can set the phone aside with the speaker on and go on about my work. I now plan such phone calls around work or tasks to minimize the frustration of being on hold. The worst part is listening to the insincere recordings about how much we mean to the company, how much they care, and how important our call is to them. I had this one from the Newark Municipal Court just about subconsciously memorized when a strange sound came through the phone. It was a human, a woman. Asking what I needed. Many phone service people are quite nice. This one wasn't. She may have hated her job, just been dumped, or just hung up from talking with an irate caller. I'll never know but I do know this was not a happy woman. I am often amazed that these people forget that they only talk with people who have a complaint or have suffered poor service elsewhere in the company. We callers want a sympathetic ear, understanding, and a solution to our problem. We want them to make our troubles go away. We don't want the person on the other end of the line to make our problems bigger or make our lives harder. This lady did not care. I asked her how much my fine would be. She pulled up the record. To find it, she asked for the Complaint number. About three digits into my reciting the number from the form, she brusquely interrupted to demand the prefix. “What's the prefix?" How was I to know that the number included letters. Remember, that was the part that the officer had torn off of the form. I did find two letters that he had handwritten nearby on the form. I assumed those to be the prefix. That seemed to work - she was now ready for the number. “You have to appear in court." What? I live in Oklahoma. Can't I just pay the fine? “No, sir. It says here: Mandatory Court Appearance". I protested. Surely, there is some provision for tourists or people who do not live anywhere near Newark, New Jersey. Nope. None. I asked to speak to a supervisor (I have learned that supervisors are usually better equipped and authorized to handle customer requests). I again clarified - there must be another option. I checked the Complaint. The box ‘Court Appearance Required' had not been checked. She put me back on hold. That dreaded hold. Fine, I hit the speaker button again and got back to whatever I was working on at my desk. After about 15 minutes of having the recording drilled into my subconscious, the line just went dead. Dead. No ‘goodbye' ‘seeya' ‘we don't care about you'. Nothing. Just dead. Shoot (which is not really the word I uttered, but its close). I did not want to call back. I set the Change of Court Date aside and got back to life. Thinking the Complaint was just one of those pesky life annoyances that I would deal with later, I put it out of my mind. I booked another trip to New York City for a week (I had tickets to see Shrek the Musical and Boeing, Boeing on Broadway). I took all the paperwork with me - the fare ticket, the credit card receipt, the original Complaint, and the Change of Court Date. I thought I would call again from New York. Which I did. Again, on hold. Again, the recording with the mechanical insincere voiceover. Again, the same response: Mandatory Court Appearance. So, I checked the website listed in the on-hold recording. I searched for the page that listed the amount of the fines for Fare Evasion. Many infractions were listed, but not that one. There was a link to email the court. Great. I wrote a nice yet persuasive email. I scanned the documents and attached those to the email. I wasn't asking for the fine to be dropped. I was asking for a way to send in payment to avoid the hassle of attending court in New Jersey. I must say, it was a great letter. I edited it and refined it until it said what I wanted in a positive cooperative manner. Phew, that should do it. I'll get a response, send in payment, and the Newark court ordeal will be over. About 5 days later, I saw an email in the Inbox from NJMC. Great, here's the news I had been waiting for. But, the reply was a form-letter format that only referred me to the website for instructions on how to pay. So far, no one on the planet had been able to tell me the amount of the fine. Phone calls, website, and email - all with no answer to a simple question of the amount of the fine. Now it was January 6. My court appearance was scheduled for Wensday, January 7 (that's how I spell Wensday - it makes more sense to me) at 5:00pm. Dang, now what. I decided to call back. This time, however, my call was answered by a more sympathetic ear. She was a bit surprised about my being from Oklahoma. She confirmed that the record glaring at her from the monitor in front of her stated Mandatory Court Appearance. I asked what I could do to pay the fine other than coming to court in Newark. I had a return flight scheduled to depart at 7:40pm - just a few hours after the court time. She said I could send a fax to the judge and hope that he would get it before the court convened. I copied the email I had written and put it into a document that I could print and fax. About this time, I decided I was tired of messing with this. I decided to just appear in court, at my scheduled date and time, and see what happens. The worst case, I thought at the time, would be that I would miss my flight, have to reschedule, and pay the reticketing fee. I could return to my apartment in Battery Park City and fly back to Oklahoma the next day. This decision made me feel good. I had been sweating it out about contacting the court and dealing with people and government bureaucracy. I decided to just go to Newark and deal with it. I was also curious why the system broke down - why I didn't receive an instruction form and why I had to appear in court even though the Complaint said No Court Appearance Required. Most of the day, Wednesday, January 7 - Jim's Court Date - I vacillated between being at peace with what I might face in the evening and being stressed out over what I might face in the evening. I had breakfast at the Ritz-Carlton as a last-hurrah treat for my final day in New York City before heading back to Oklahoma to begin teaching for what will likely be my very last semester of full-time college teaching. Breakfast was okay - you get more food at Denny's or IHop, and it was expensive. But, what the hell. Live a little. A vegetable omelet, some weird fancy potato patty, dry whole wheat toast (I ordered it dry), and, of course, my addiction - coffee. With cream and Splenda. The Ritz-Carlton is just 3 buildings away from my condo building and its an easy walk along Battery Place, past the Skyscraper Museum and the Museum of Jewish Heritage (that may not be the correct name, but its something like that). Inside the Ritz, where I never did have to open my own door, the environment was nice, and I enjoyed eavesdropping on the conversation to my right. Two attractive middle-aged women discussing their clients and the impact of the recession and the coming spring of more bad financial news. Across the room, sitting alone, was a businessman talking on his cell phone loud enough for all of us to get a pretty good understanding of why he was sitting alone. The rest of the day was spent cleaning the apartment, doing laundry, reading, and taking the trash and the recycle bins to the Refuse Closet down the hall in the Cove Club condominium. Court was scheduled for 5pm. I wanted to get there a bit early to talk to someone about my unique case and plead for an easy out. I packed my briefcase, locked the apartment, and left at about 3:30 in the afternoon. I only had to carry my briefcase with me. In it was my laptop, an iPod, a few papers, a book to read (Angels & Demons, for the second time), and, of course, my documents from the PATH station and the Newark Municipal Court. I rode down in the elevator alone. Just me, my curiosity, and a slight bit of apprehension. What would happen this evening? In the elevator lobby, I took a left instead of going straight to go out the front door of the building. The front door faces the Hudson River and I needed to go to the World Trade Center. To the left takes one directly to the back door and to the city, saving some steps. I walked north along West Street up to the World Financial Center. I looked at people around me, very few of whom, I suspect, were going to night court. I acted like I wasn't either. I had only been in front of a judge three times before. Once as foreman of a jury in a case of some drunk driver. We found him not guilty of one charge but guilty of the more serious one. A tough decision. Deciding on the future of someone is a sobering task. Another time was for parking in a handicap parking place on campus. However, the parking lot was under construction and the handicap area was not clearly marked. I recreated the scene with my car and took photographs. At my hearing, I showed the photos to the ticketing officer on the witness stand who acknowledged, “Yes, that's where your car was parked." I then handed the photos to the judge. “Your Honor, is my car in a handicap parking place?" “No, its not." His Honor cut my fine in half. I accepted his judgment only because I was afraid if I had questioned him - “If I'm not parked in a handicap place, then aren't I innocent of this charge and, therefore, why should I pay any fine at all?" But I didn't want to upset his Honor and blow my reduced fine. I left the courtroom, paid at the window in the lobby, and left, feeling halfway victorious. The third time was helping the president of a college fraternity answer some noise complaints from neighbors (I was the Faculty Advisor for the fraternity). Fraternities at college campuses make lots of noise. That's what they do. That's what they're supposed to do. These neighbors had been fighting us for months. We also got out of that one. I suspect the judge had been in a fraternity years ago and just smiled when he remembered his college days. At the World Trade Center, I walked across the temporary bridge to the Trade Center site. The previous bridge was destroyed on 9/11. This new bridge spanned West Street about where George Bush stood on the rubble with the bullhorn and promised that we would catch the cowards. At the end of the escalator down from the bridge, across from the brand new 7 World Trade Center Building, is the temporary PATH station. 7WTC was rebuilt as soon as the rubble was cleared from its site. Building number 7 was the last to fall - it collapsed about 5:00 in the afternoon of the 11th. Completely empty, everyone had evacuated hours earlier, but the building became nothing more than a pile of steel and concrete rubble. The building housed an electrical substation and the city needed to get it operating again to provide power to downtown. The footprint of the building is smaller than the original 7WTC but it is taller. The smaller footprint allowed the city to rebuild streets through the Trade Center site. In the 1970s, when the WTC was built, 12 city blocks were closed off. That turned out to be a mistake - the city would restore many of those streets in the new site plan. Down two levels, beneath the subway line whose WTC station has yet to reopen, I bought my ticket for the PATH train, having some flashbacks to that December day a few weeks earlier when this all started. I inserted the card - no error message. No red screen. Just a single green word: Go. Down the stairs marked ‘Newark'. The staircase marked ‘Hoboken' would have taken me to Frank Sinatra's hometown. Fun but not where I needed to go this afternoon. I had a date with the judicial system in Newark. It was a little cold on the platform. Even though we're about 3 stories below ground, the sides of the PATH platform are open. The structure is temporary - it was put up in a hurry in the bathtub pit of the Trade Center to get the trains running again. On the other side of a fabric barrier was the ongoing construction for both the new Freedom Tower and the National September 11 Memorial. It had rained that morning but now was dry. I had decided not to bring my umbrella since I would have to keep up with it on the flight back to Oklahoma. I paced the platform, not because I was apprehensive about going to court, but because I was too cold to sit down. Besides, there were only a couple of spots left on the few platform benches. Well, maybe I was apprehensive. I didn't know what I was headed for. I pulled out my phone and used the map function to locate the courthouse in Newark. It seemed to be a short walk from the Newark Penn train station. Good. The PATH train curved around the bend at the end of the platform. These trains have been making this run for decades. Before the Trade Center was built overhead, the tracks went to Church Street, on the perimeter of the WTC site, into the basement of a solid brick building called the Terminal Building. During demolition of that building and construction of the Trade Center, the trains kept running. Construction crews worked around the tracks, even supporting them in a tube through the WTC pit. These trains have long been a vital link between downtown Manhattan and New Jersey. Within steps of the WTC PATH station are six or seven subway lines that spread out all over the New York City metro - the Bronx, Queens, Brooklyn, the Upper East Side, you name it, you could get there from here. Since the WTC station is the end of the line, all of the arriving passengers get off and the train is completely empty (a rare sight in the city). I stepped aboard and promptly found a seat in a car towards the middle. I often will sit towards the middle of the train (except during rush hours when those cars are standing room only) since most stations have their exits in the middle of the platform. Its one more game that New Yorkers play as part of their daily routine - planning ahead to where their next exit will be and getting close to that spot in the 2-block long row of train cars. The ride was uneventful. We sat for a few minutes in the WTC station as hurried commuters ran down the steps and into the cars. The car filled up. I held my briefcase on my lap. A familiar recorded announcement requested listeners to mind the closing doors. The train curves back towards the Hudson River and then goes right under the beams and concrete walls that will be the basement for the new Freedom Tower that is rising up to recapture the dominance of the skyline that the Towers once held. Then its under the Hudson and into New Jersey. After 2 stops, the train emerges from under ground and becomes an elevated train for the rest of its journey into Newark, which is the other end of the line. Not a word was spoken on the train. Many commuter trains are usually quiet. After about a 25 minute trip, we pull into Penn Station. Not the famous one, but the one in Newark. It, too, is quite grand and busy. The Pennsylvania Railroad built these spectacular palaces for rail travel as a way of competing against the many other railroad companies. Several of them were simply referred to as ‘Penn Station'. We stopped at the same platform where I had been caught and cited. I found my way down to the ground level and to a much-needed bathroom. Ah. Better. Then I checked the map again on my phone to get my bearings. I passed through the main waiting room and outside to the hustle of rush hour traffic. It was now about 4:15 and it was already dark (it gets dark early in the city since it is on the eastern edge of the Eastern Time Zone) and it was cold and raining. Shoot. Of course, I chose not to bring an umbrella. I was wearing a jacket with a hood so I pulled that up over my head and clutched my briefcase. I wanted to check the map on my phone but didn't want to risk bringing it out into the rain. So, I made my way to the courthouse from memory. Dark. Cold. Rain. I was both excited and scared. Excited for the adventure that I might be able to experience and scared for the unknown consequences of that adventure. I was in downtown Newark doing something that was fairly new to me. Wow. There's the new arena for the New Jersey Devils hockey team. A very imposing full-block-long building with a soaring 40 foot tall glassed lobby enclosing a sculptural LED light fixture. I couldn't really appreciate the beauty and scale of the arena due to the rain I had to peer through. I pulled the hood tighter and trudged on to 31 Green Street. There was a good system of civic signage and wayfinding that listed attractions in downtown Newark. In the list was 'Court House' with an accompanying arrow. Confirmation. I was going in the right direction. A few blocks ahead I saw what looked like the right building: a formal symmetrical layout of the facade and plan, a design element borrowed from the ancient Greeks to convey order, strength, and comfort. It was a stone building with people coming and going through the set of 3 identical doorways in the very center section of the stately building. Whew. I'm there. Let the legal proceedings begin. Well, okay, not until I pass through security. The small lobby was probably more grand at one time. Now it is filled with a security scanner, conveyor belt, and the stanchions that organize the throngs coming to court. Back and forth in the maze of barriers. Tonight, however, there was no line. I stepped right up to the machine and emptied my pockets into the plastic basket. I asked if I needed to take off my belt and my shoes. A got a nod back that told me it wasn't necessary. I went up 3 wide steps to the intersection - the cross between the two axes of the building floor plan. I looked up and down the hallways but saw no indication of where I should go. I checked the Change of Court Date form again. I didn't find a room number (but, remember, these forms are poorly designed - its hard to find info). I asked a security guard. “On the second floor, when you get off the elevator, there's a directory that lists everything in the building." Okay. To the elevator. Up on the second floor lobby I searched the lobby, the hallways. Nothing. No signs. No directory. I'm starting to panic a bit. Strange building, a court appearance, a flight leaving in a few hours, and I seem to be lost. I turned and saw a woman coming down the hallway. Her hands were full of papers but I asked for help. She smiled, looked at my form and told me exactly where the courtroom was - back downstairs. I then noticed that the room number was listed on the form. I just overlooked it in my haste and apprehension. I thanked her and found the staircase. She had headed that way also. I prefer to walk the stairs when going just one flight. It doesn't make much sense to wait on an elevator and use the electrical energy to transport me a matter of 10 feet up or down. So I walked. And so did she. Towards the bottom of the open marble staircase, she again guided me exactly where to go, “Take a right and go to the end of the hall. Room 105 is on the left". I thanked her again. What a delightful woman. At the bottom of the stairs, I turned right and went down to the end of the hall. There were two sets of doors, each propped open and each leading into Room 105. This appeared to have been a courtroom at one time - at least it was laid out like one. There was a gallery of seats, a low dividing wall, and up at the front of the room, which was to the right as you step into the room, was a glassed in counter with room for 3 or 4 clerks. There were 3 when I got in line but one lady left soon after. The line was about 12 people strong. I sized up the situation and guessed that I should get in this line and wait my turn to speak to one of the people at the front. Behind the glass, the space was somewhat chaotic - papers, computers, files, lots of junk. The guy behind me, I don't remember his name, chatted up a conversation. He was most concerned about who he might have to talk to when he got to the front of the line. On the right was a large middle-aged black woman who looked like she had forgotten how to operate her smile muscles. She meant business and made it clear you were not to mess with her. No pity. Life's tough. Deal with it. Your problems are of no concern to me and its not my job to make you feel better about your sins. On the left was a quieter white-haired older black gentleman. He's the one we all wanted to handle our case. I was getting tired of my heavy briefcase so I set it in one of the empty chairs. All but one of the chairs were empty. I don't know why they still needed the chairs. This seemed to be just a ‘check-in' room where people began their journey through the Newark New Jersey judicial system. Most of the people in line did not look happy. Many were bitching about ‘the man' or ‘the system' that treated them unfairly. We are all innocent. Its not our fault that we got caught. I was not guilty of Fare Evasion. I paid my fare. I have a receipt if you don't believe me. What I was guilty of was not following the proper procedure. The system was set up in which I was supposed to use the courtesy telephone and call for help (I don't know what the person on the other end of the line would have told me or would have done). But, according to the officer, I should have called for help. So, on one hand I was innocent but on the other, I did walk through the handicap gate without inserting a fare card. “Next." I got the older man. Great. He pulled up my Complaint on the computer in front of him. I imagine if he had been working at 31 Green Street for a while, he had seen a lot of technological changes come across his desk. He was now using a sophisticated computer that gave him all the information he needed. In this case, it printed out a sheet that told us when my court date would be - January 27, 2009. He slid the single sheet of paper through the half-round opening at the bottom of the glass divider. He had circled the date, 1-27-2009. What? I asked if I could just pay the fine. I had learned from others in line and from a chart on the wall that the fine should be somewhere between $52 and $72. I could pay that. I had brought about $200 in cash, a blank check, and, of course, my credit card. I wanted to pay and go. Let me pay the fine, catch my flight, and get out of New Jersey and back to the comfort of Oklahoma. “No, you can't pay that here. Is it Jamal? We just check you into the system and assign court dates." He had apparently misread the Complaint and read my name as Jamal. But, I protested, I can't come back on the 27th. I live in Oklahoma and I'm flying there in about 2 hours. “Oklahoma!" “Oklahoma!" he repeated as he stepped back. Well, golly, what do I do about that. The older man looked genuinely confused and bewildered. I doubt he has had to deal with Oklahomans very often. This was downtown Newark. What's a guy from Oklahoma doing here and why do I have to deal with him? “Are you really from Oklahoma? Are you really flying tonight? Do you have a boarding pass?" “Yes, I do", motioning to my briefcase, “It's right here." “Well, I don't know what to do." Maybe he hadn't worked here very long. Maybe he really hadn't seen it all. He looked at the woman, who had heard all of this (as had almost everyone waiting in line), and asked her what he should do. She turned out to be very cool. And helpful. She recommended he go down to the courtroom and see if they could squeeze me in among tonight's cases. He was at a loss, he apparently know of no better option. So he looked back at me, and, with a polite but still uncertain smile, told me to have a seat. He'd be right back. He left the glassed-in room and walked out towards the hall, the same hall the kind woman had guided me down. I turned and saw the amused looks on the faces of those in line, and took a seat in the gallery. Me and my briefcase all alone over on that side of the room. I pulled out my phone to check the time. 4:55. Flight to OKC: 7:40. It was nice to sit down. I hadn't sat since the PATH train pulling into Newark Penn and I was tired of walking, standing, and shouldering the heavy briefcase. He wasn't gone too long before he stepped into the waiting area of the gallery. “Oklahoma!" bellowed off the walls of the room. Of course, everyone turned and stared at me. I smiled, nodded acknowledgment - yep, that would be me, and walked around the low wood wall to the door where he was standing. “Follow me." We walked back down the hall, past the entrance foyer and the security equipment and down the hall to the opposite side of the building. We entered a court room that was full of people sitting and waiting. He turned to me, said, “Wait here", and went up to a desk next to the judge's box and talked to whomever was sitting there. Maybe a court clerk? Right inside the wood wall in this room was a well-dressed man standing at a pile of papers. Well-dressed people stood out in this room. Most of the people sitting in the gallery were just what you would expect to see at night court in Newark, New Jersey. The well-dressed man motioned for me to approach him. He asked what was going on. I explained the whole situation - the ticket, the error messages, the panic, the handicap entrance. I showed him my PATH ticket, my credit card receipt, and the Complaint. I pointed out that the time, 12:20, was identical on all 3 documents. I admitted that I made a mistake and that I had no intention of cheating the city. I had paid my fare. He listened intently and with a look of empathy. He said he would drop the fine but I would have to pay the court costs. Responding to the quizzical look on my face, he offered, “$21.00". I looked relieved and thanked him. He told me to take a seat and wait for the judge to call my case. I then mentioned that I had a boarding pass for a flight in about 2 hours - did he know how long this would take. When would the judge begin (it was already about 5:10)? He said the judge would begin whenever he came out of his chambers. He didn't know when that would be - he's the judge and he comes out when he's ready. Softening a bit, he leaned towards me and said that he'd try to expedite my case towards the front. I understood that he didn't want the others right behind me in the gallery to hear this preferential treatment. I thanked him sincerely and turned around to find a seat. I saw a spot on the second row about two people in from the end. The guy on the aisle appeared to be sleeping. “Excuse me" I nudged him and scootched in front of his legs, holding onto the back of the pew-like bench. The second guy turned aside to give me more room. To a seat and down. I set my briefcase beside me and looked around the room, checking out the crowd, the clothes, the faces. The well-dressed man I had just talked to walked along the wall, spotted me, and said, “But, you'll have to plead guilty." I nodded my acceptance. I was just glad to have to only pay $21 and for the prospect that I might be able to make my flight. I found out later that this man was the prosecutor for tonight's cases. I finally felt some relief that the resolution of my case was in progress. Though I had brought a book to read, this just didn't seem like the right time or place to read a novel. Heck, I was living a better story right then. No need for a novel for escape. I also did not want to pull out my iPhone. I suspect that there was a pretty low percentage of people with $300 cell phones in their pockets. I didn't want to flaunt mine. Within about 5 or 10 minutes, a booming voice interrupted my thoughts. “All rise." We did. Damn - the tone, clarity, and volume of the voice alone insisted we obey. The judge made his entrance with his black flowing regalia. Just like on television. He motioned for us to be seated. He gave a concise and clear introduction to the process that would take place this evening. We had instructions to be very quiet as the proceedings would be recorded. He stated that he would first call those cases in which the defendant was accompanied by legal counsel. He didn't want to waste the time of the lawyers present. He dove right in to the caseload. After hearing from those with lawyers, he heard from those cases that had police officers present. I assume he wanted those officers to get home or back to work. That makes sense. Those few cases seemed to be just formalities of checking in and getting some information from the officers. I couldn't hear what those first cases were about - the defendants had their backs to us as they stood at the table facing the microphones and the judge. I was intrigued at how shabbily dressed some of these people were. They were in a court of law and asking for leniency. But, then I looked down and saw that I was wearing a grey sweatshirt, black jeans, and worn-out sneakers. Comfortable clothes for the flight. I wish sometimes that I wouldn't be quite so quick to judge others. It was now about 5:33, according to the white-faced clock on the wall behind the judge. The prosecutor had said he would try to get me out by “quarter to six". I started to worry abou“James Watson" interrupted my thought. That was me. The judge had called my name. Now what. What do I do. Wait, I should walk up to the table. Of course, that's what to do. Get up there. Don't stall. This guy has the fate of your evening in his hands. Go. What are you doing? I have to get my briefcase. Oh no, I've got to squeeze past these guys again. What if people think the white guy goes next just because he's white. Are they glaring at me? Shut up and get up there. Okay, okay. I'm at the table. How did I get here? Did I go through that gate or jump over the wall. I don't remember. How long did that take. Where did I put my briefcase. My laptop is in there. Would someone tell me - what the heck am I supposed to do now. What do I say? The judge calmly asked me to tell him what happened. Going into some robotic mode, I narrated the details, just as I had to two other people and as I had many times in my mind in preparation for this very moment. The moment I had been anticipating for weeks was happening right now. At this instant. But the judge wasn't really listening. He seemed preoccupied with something in front of him on his counter. I was still talking. I was alone in the middle of a vast open space. There were no people behind me like there was earlier. Empty. Nobody on either side. The bailiff, clerks, recorders - all gone. Just me, standing in the middle of this space. The next thing I hear from the judge is “Case dismissed." Case dismissed. Zing, I'm back in the room. Everyone came back. It was crowded and hectic again. Case dismissed. It didn't register. What does that mean? Do I still pay court costs? Do I have to sign some forms? Do I make this official with a ritual password or hand gesture? What do I do now? What I did was to just stand there like an idiot. Well, I guess it was just like an idiot. I've never seen an idiot standing anywhere so I don't really know what it looks like. But I would guess it would look something like me at that moment. Frozen. I probably should move but I'm so confused. Finally, the bailiff came over, leaned across the table, and quietly said, “You can go." I turned around, picked up my briefcase, stepped back through the swinging wooden gate, past the guys in my former row, past the staring faces in the gallery, and out the door into the hall. I was breathing again. There were several people in the hall, probably waiting on friends and family in the courtroom. I was still a bit dazed. Case dismissed. I can go. I slowly walked down the hall towards the foyer. Wait. Oh no, I never thanked the judge. “Thank you, your Honor." I never said that. Shouldn't I have said that? Of course, I should have. But I didn't. Do I go back in? Right then, coming down the hall towards me was a woman I recognized as having been in the courtroom earlier in some official manner - a clerk, a recorder, something. I stopped her and relayed what the judge had said. “Am I free to go? Is that it?" “Yes, that's it." I then begged her to thank the judge for me. I told her I did not want to interrupt the proceedings. This judge was so efficient I was sure he was in the midst of another case. She was chuckling at my desperation. Yes, she would be happy to thank the judge for me. Phew. I feel better. How rude to have a case dismissed and not thank the judge for his consideration. I stood in the foyer, still slightly dazed. It began to register - case dismissed. No fine. No court cost. No returning on January 27th. Nothing. I'm done. And its only 5:40. I have two hours until the jet takes off for Oklahoma. “Down the ramp, please." (I had started to exit through the entrance). My brain was busy and not yet thinking clearly. Okay, down the ramp, to the door, through the vestibule with two women hiding from the cold. Out through the front doors and down the steps. It had stopped raining. I'm done. Its over. Really over. Case dismissed. I smiled. Really big.